When I take time to reflect on life before Spaulding Youth Center, the word ‘uncertainty’ comes to mind. My husband and I were unsure of what each school day would bring for our son, Joshua. 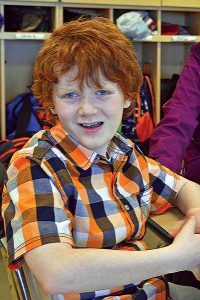 We only knew that life for Josh at school was getting more difficult and the school was not prepared to handle his needs. Life at home was a challenge as well, as Josh could not communicate with his family at all. When he started to get kicked out of school every 3 to 4 days for hitting and other bad behavior, we knew it was time for a change. We toured a school in Vermont which was conveniently located to our home, but it just didn’t offer the programs and opportunities of another school we heard about in Northfield, NH, Spaulding Youth Center. Though Spaulding was over an hour away from where we lived, we knew it was the right place for our son as soon as we visited the beautiful campus, met the friendly staff, and learned about its amazing programs. We took a leap of faith and enrolled Josh. Almost instantly, that previous feeling of uncertainty disappeared. Shortly after Josh began his journey at Spaulding, he turned into an entirely different kid. He was able to stay in school all day and actually enjoyed it. There was no more hitting, no more whining and no more bad behavior. He wasn’t being asked to leave school anymore. Instead, he was thriving in his environment. This good behavior carried over to home and our family is blessed that Josh’s needs are being met and he is a much happier child. Josh loves Spaulding. 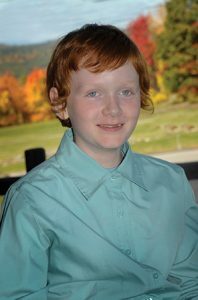 He loves being involved in school events and activities, and especially enjoys the EChO program. He loves being outdoors and is excited to take part in hiking, rock climbing, ziplining and other action-packed activities this excellent program offers. Thank you to the staff at Spaulding Youth Center who really go above and beyond for each child and their families or caregivers. I would especially like to thank Josh’s teacher for working with him so diligently and for truly caring about Josh and every other student in her classroom. Josh’s assistant is also someone we are so thankful is a part of Josh’s life. Whenever Josh has the opportunity to work with her, he comes home with a smile and sings all day long. She has truly made a huge positive impact on Josh. And last but not least, many heartfelt thanks to his speech pathologist and occupational therapist who spend countless, patient hours working with Josh. As I mentioned, Josh was getting kicked out of his old school on a regular basis for bad behavior. Last year, Spaulding Youth Center presented him with the Student of the Year award. To go from one extreme to the other in such a short time is truly extraordinary. Our family could not be more proud, thankful and happy that Josh is doing so well – and it’s all thanks to the wonderful community at Spaulding Youth Center.